In an attempt to escape from the heat and humidity of mid-July summer, we headed up to the mountains of Kauai also known as Kokee or Waimea Canyon State Park. At about 4,000 feet above sea level we certainly found a cool breeze along with a light, misty rain. The thing I love most about going up to Kokee is the peace and quiet and solitude, and that is exactly what you will find especially on a day during the work week. Weekends are usually much busier. We always take a ride up to the park right in front of the Kokee Lodge and the Kokee Museum. It's our favorite spot and is just right for a picnic. Coming up from Waimea, we stopped at Ishihara Market and picked up some bentos, poke, potato salad, and fruit for lunch. I packed hot tea in Joe's old thermos from the old days when he used to work at the sugar plantation as a haul cane truck driver. He used to bring his hot coffee in the thermos and store it behind the seat of the old haul cane truck. The truck would bounce around on the rocky roads, and that's where the thermos got a nice little "smash" on it's side. It's still good, though, and holds plenty heat. Joe also made sure to pack his MP3 player so we could sit back, relax, and enjoy some nice Hawaiian music, especially IZ. We just pulled into the park and there is hardly anyone here except for a few campers who are already packing up their two small tents to go home. There is a chicken clucking around our table looking for food, and there are some myna birds off in the distance with a red-crested cardinal. 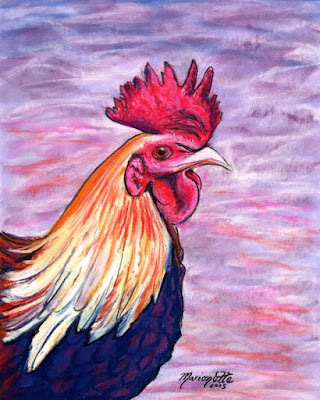 Right now the only things I hear are Joe's music playing softly, the sound of a few roosters crowing, and some doves and other birds making cheerful chirping noises. Ah bliss!!! It's pretty cool up here even though it was forecast to be 90 degrees Fahrenheit at sea level. I am actually wearing a sweater. It's a bit cloudy as I look up in the sky surrounded by pine trees and ohia lehua trees. I love the fresh smell up here, especially the smell of the eucalyptus trees. As I go for a walk around the park, I spot some of my favorite wild flowers. Most of these flowers are actually non-native, invasive species that have taken over. However, most of them have been here in the twenty some years since I first discovered Kokee. They have become familiar to me. 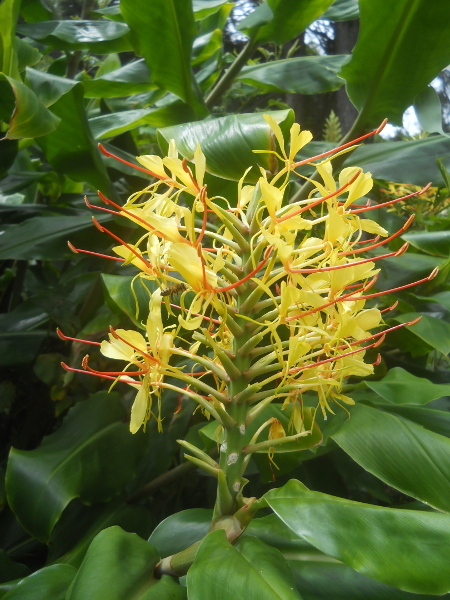 First I spot the bright and colorful wild Kahili Ginger which is named after a feather standard that the Hawaiian royalty used in ancient days. It's scientific name is Hedychium gardnerianum. 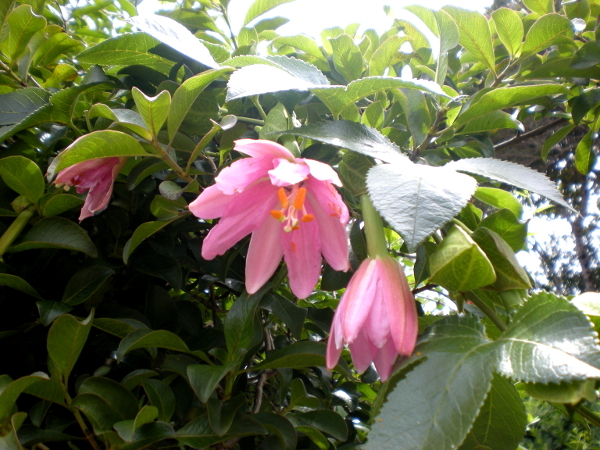 Another invasive species is the wild liliko'i vine that has a pretty pink flower and a football shaped fruit. It is called the banana poka flower, and it's scientific name is Passiflora tarminiana. 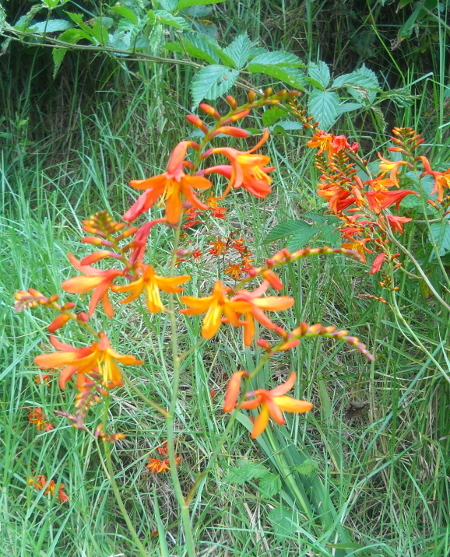 I also spot some red fuchsia bolivia and some orange crocosmia, also invasive species. 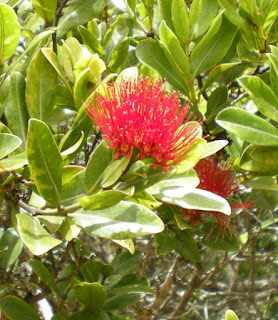 About the only flower I see that is native to Kokee is the lovely, red ohi'a lehua flower, a flowering evergreen tree from the myrtle family. This tree is a very important tree in Hawaiian culture as it grows in volcanic areas and it is a sacred flower of Pele, the Volcano Goddess. 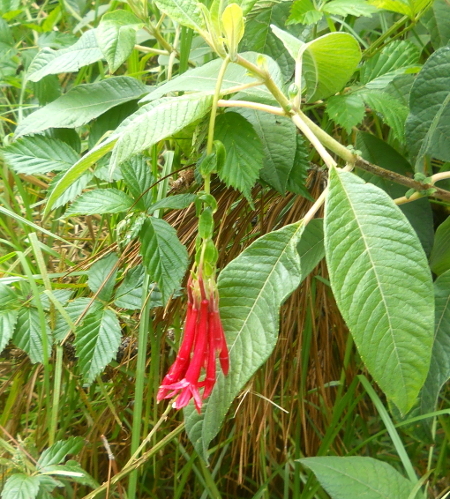 In fact it is usually the first plant that grows after a fresh lava flow. I head back to our picnic table for lunch, and as soon as we get the food out, it starts to rain lightly. Thank goodness we had the beach umbrella in the trunk. We use it to cover us and the food while we ate. 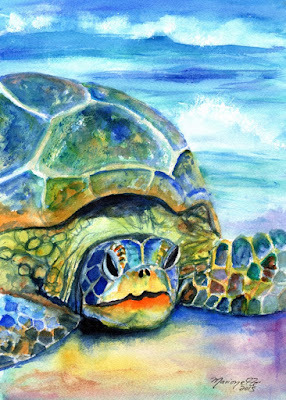 Next, we experience a slight case of "Hawaiian paralysis" which is basically nap time after lunch. Time to visit the Kokee Museum and then head down the mountain to finish off another perfect day on Kauai. 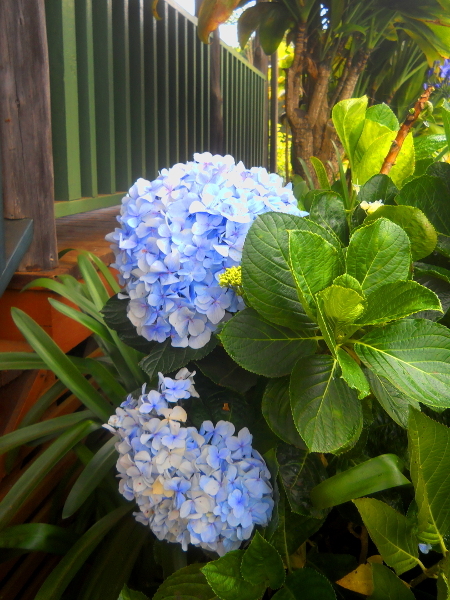 I hope you have enjoyed this little, relaxing adventure to one of the most interesting places on Kauai! 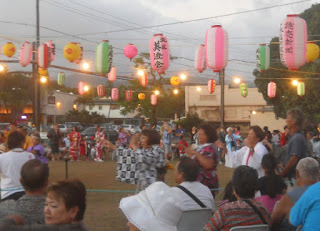 With the smell of incense intertwined with freshly grilled yakitori wafting through the air, I know it is that time of year again...time for Kauai's Bon Dance events. 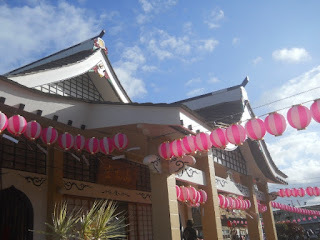 I'm not a dancer myself, but I thoroughly enjoy this fun, family event as I sample the local foods, marvel at the brightly colored lanterns strung around the temple, listen to the beat of the Taiko drums, and eye the beautiful Japanese-American ladies dressed up in their kimonos, happi coats, and yukatas. Bon is a time to honor the spirits of the deceased family members. 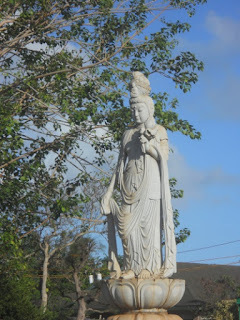 It originates with the Buddha who helped one of his disciples with his deceased mother's spirit by offering her food so that she wouldn't be hungry and would be released from the Realm of Hungry Ghosts. 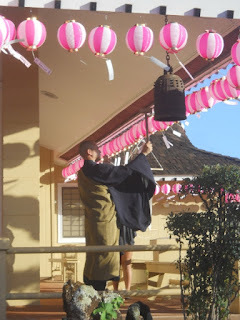 He was so happy that he danced with joy and that is where we get the Bon odori or Bon Dance. During Bon, offerings of food are also placed on altars and graves of loved ones, and the lanterns are strung in memory of family members who have passed. Bon odori also differs from region to region in the style of dance, music and food. 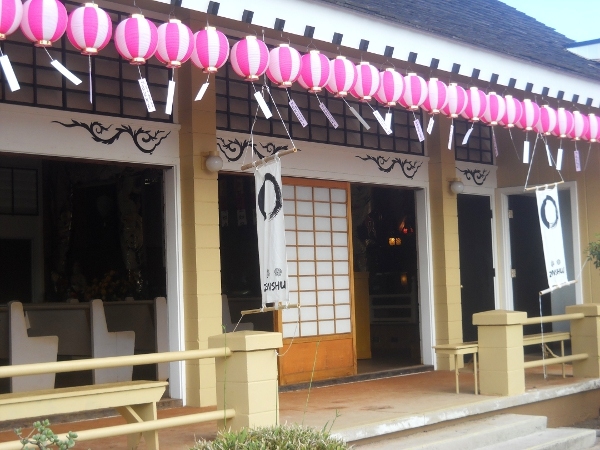 On Kauai you will find unique dishes from this region as well as traditional Japanese food. My favorites are the flying saucers, saimin, yakitori, pastele plates, smoked meat, and manju to name a few. You will also be treated to the sounds of Kauai's own Taiko Kauai, a very energetic and fun precision drumming group. As if this wasn't enough, there are game booths for the keiki, cultural displays, shave ice, and special performances. But, of course, the main attraction is always the dancing of the local people in a circle around a raised platform. They invite everyone who wants to dance (even visitors) to join the circle. And then at the end of the event, they have a fire burning ceremony called Taklage where the spirits are sent back home. 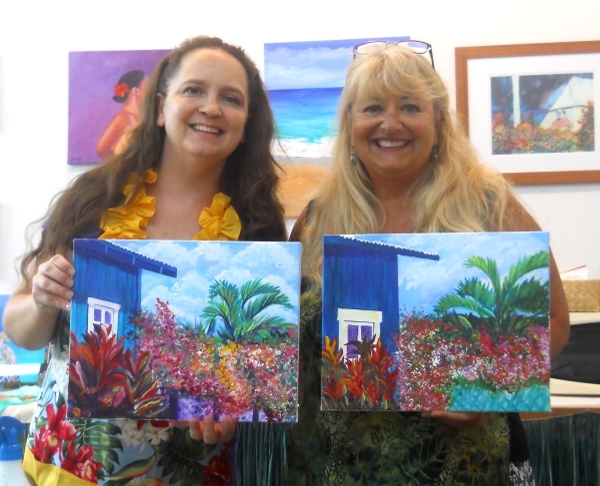 After just finishing and mailing in her fifth book in the Tiki Goddess Mystery series, best selling Kauai author, Jill Marie Landis, decided to treat herself to a relaxing acrylic painting class at my art studio. I was thrilled to finally meet her in person, and she is just as warm and bubbly as I had imagined. I recently read the first book in her series, Mai Tai One On, and just loved it. 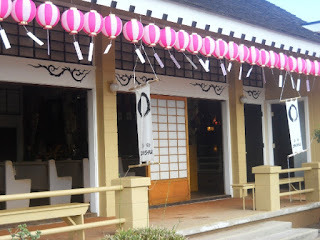 If you know Kauai's north shore, you will recognize the tiki bar in the story as Kauai's own Tahiti Nui of Hanalei, an actual restaurant and bar and luau party place. If you love murder mysteries and Kauai, then you will enjoy her book as the tale takes you to many familiar places around Kauai with an exotic, hula dancing, tropical beat to the story. As two creative people and business women, we naturally hit it off and spent the afternoon "talking story" about books, art, Kauai, and our lives. 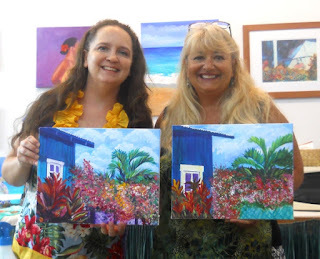 We also had a fun time painting these tropical cottage paintings. 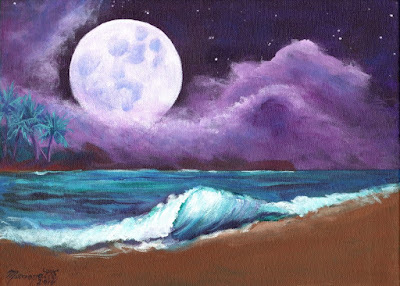 Jill has written thirty books now and they include romance novels, historical romances, inspirational romances, and her new Kauai based fun mysteries. She has appeared on several best seller lists and has won many awards. 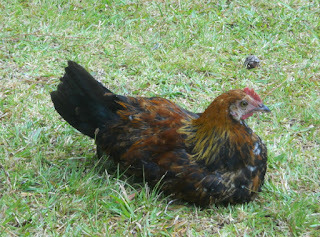 She resides on the island of Kauai, and I am glad to be able to call her my friend and neighbor. I can't wait to read this one! The story is supposed to take place mainly on Kauai's east side of the island, also known as the Coconut Coast. Hey, What You Lookin' at? 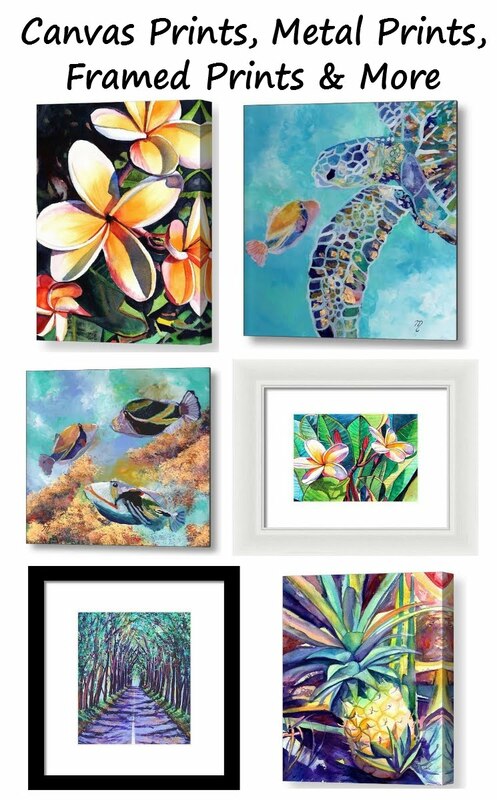 It's all the rage on the mainland and now it's coming to Kauai! 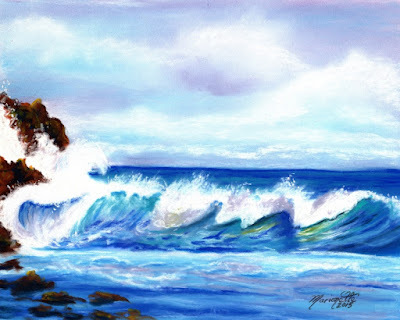 Join me as I guide the whole group in a step-by-step original acrylic painting on canvas. Any skill level is welcome! I will also be serving some local style pupus, fruit, and cheese and will have water, juice and soda available to drink. Feel free to BYOB or BYOW (bring your own wine). Class fee is $65 per person. 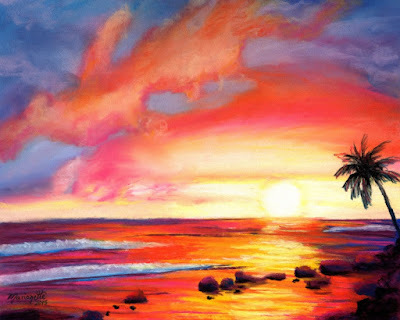 If you would like to book a private painting party, please contact me at 808-631-9173. 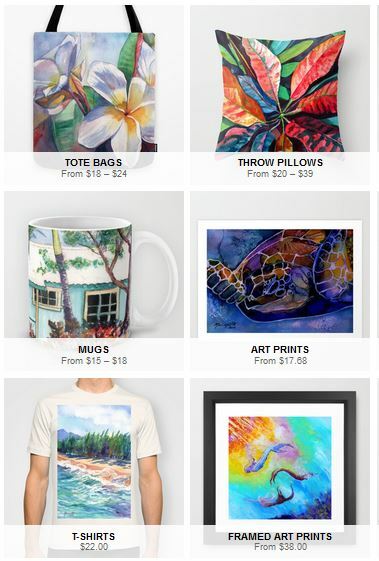 There is a minimum of three people per private painting party and you can choose from one of these subjects: Palm trees, Polihale Beach, Rooster, Crazy Bamboo, or I can come up with a special design for your group. 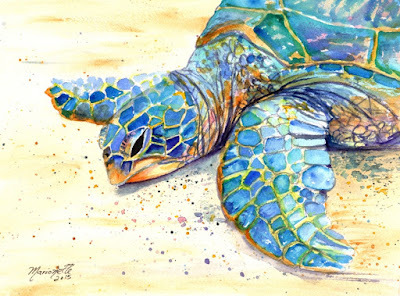 Finished painting size is 11"x14". If you prefer to bring your own food or not have any at all, then the price would be $50 per person. Aloha and Mahalo for stopping by!